Begins at 3 p.m. and rooms are guaranteed by 5 p.m. Central Time 7 days per week. Check-in time is strictly enforced to allow for proper cleaning of our rentals. Should your arrival be on a holiday or after 5:00 PM, please call our office for late check-in instructions. All reservations must be made by an adult over the age of 25. Reservations must have one adult over the age of 25 for every 3 persons under the age of 25 occupying the unit during the full time of the reservation. Married couples under 25 are allowed as long as a Certificate of Marriage is provided upon check-in. Reservations made under false pretense will be subject to eviction and forfeiture of deposit and/or monies paid. Identification must be shown upon check-in for verification of age. 25% of the reservation total is required upon booking to reserve a vacation rental. Reservations made 14 days or less prior to arrival require an electronic check or credit card payment upon booking. Final payments are due in full 14 days prior to arrival. Payments may be made by cash, travelers check, bank money order, credit card or personal check with proper identification. If payment is not received by the payment due date, the credit card given at the time of booking will be used to charge the final payment prior to arrival. In the event of cancellation, refunds must be obtained from Travel Guard Insurance and are subject to their policies and conditions. To protect the loss of your rental payments, travel insurance is strongly recommended. Rental agreements may be terminated by the Agent or guest at any time after satisfying any cancellation policies and complying with any laws that may apply. Guest shall not be relieved of any portion of their reservation due to weather, flight cancellations, or any travel-related or other issues which may arise and which are not under control of Navarre Properties. Navarre Properties, Inc. strongly recommends guests protect their travel investment with the purchase of Travel Guard Protection. Cancellations received more than 14 days prior to arrival will result in a loss equal to the advance payment and/or security deposit. Cancellations received 14 days or less prior to arrival, including cancellation on the day of arrival and early departures after check-in, are fully non-refundable unless covered by Travel Guard Protection. 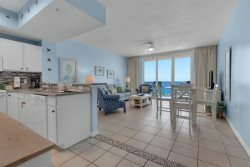 Because Navarre Properties, Inc. carefully schedules reservations in advance, no partial refunds will be made for late arrivals or early departures. No refund will be given for early departures for any reason, weather-related or not. Return Home with Vacation Memories, not repair costs. With the Accidental Rental Damage Waiver in place, you'll no longer have to worry about tying up your credit card with a sizable security deposit or about how much will be returned when you get home. The $40 ARDW is non-optional, non-refundable, and will cover Accidental Damages to your vacation home, up to $1000. Items not covered by the ARDW: Intentional Damages to the unit, Pet damages in a non-pet friendly home, Damages in excess of $1000.00, or damages not reported to the office. Please notify the office of any broken or missing items immediately upon arrival. Please Note: The ARDW is not insurance, nor is it a cancellation policy. Navarre Properties will only issue refunds in the event of a Mandatory Evacuation. Accommodations will be cleaned to quality standards prior to your arrival and after your departure. You will be responsible for cleaning of your unit during your stay and leaving it in good condition at check-out. Please remember that you are staying in someone's home during your vacation; please treat it as if it were your own. Accommodations have complete linen packages provided. We ask that you bring your own beach towels and beach blankets as linens must not be removed from accommodations. Guests will be charged for missing and/or damaged linens. A complimentary set-up of trash liners, bathroom tissue, and facial soap is provided but guests must provide any additional items as needed. Please see our website at About Us and click on F&Q for suggested items to bring. Locked closets are maintained by homeowners for personal use and are not included in the rental. All rental properties have fully equipped kitchens, coffee makers, dishwashers, televisions, microwave ovens, DVD players, central heat, and air conditioning. Pets are not allowed in most properties (check our web page for Pet-Friendly Rentals). Smoking is not allowed in any of our properties. Additional charges will be incurred for carpet and upholstery cleaning as well as deodorizing if ANY evidence of smoking is found in our accommodations. In rare instances, a unit that has been reserved may become unavailable. We reserve the right to change your reservation to like or better accommodations. Rates may vary and Navarre Properties' liability shall be limited to a refund of deposit. Please park in designated areas only. Most properties allow only 2 vehicles, no boats, RVs or trailers. Specific properties do have vehicle restrictions and require parking permits. Please visit our website for Navarre Beach Area boat and RV storage facilities. Navarre Properties, Inc. will not be liable for any damages to rental property or furnishings, nor for injuries resulting from any accident that may occur in or on the premises during guest occupancy. Representatives of Navarre Properties, Inc. or unit owners may enter the premises at any reasonable time to make repairs. Navarre Properties, Inc. will not be held responsible for acts of theft or vandalism or other damages to the guest's personal items left in the unit. Neither Navarre Properties, Inc. nor the unit owner is responsible for personal items left on the premises by guest upon departure. Units may not be sublet. Please remember that these policies and guidelines are set forth for your protection, as well as the protection of the properties managed by Navarre Properties, Inc., and will be strictly enforced.